We've just added a further 73 brilliant route guides from Nick Cotton Rides to the ViewRanger trails and routes content library. 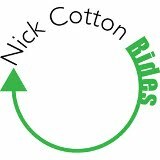 Featuring routes from the Cotswolds and from Dorset, this latest collection joins the 200 existing Nick Cotton Rides already available. These routes, like all ViewRanger routes, are available to download in the ViewRanger app for Apple, Android and Symbian smartphones and tablets. They are also available to discover and browse within the new ViewRanger online community and trip planning website. Find these routes at the Nick Cotton Rides profile page within the my.viewranger online community or search within the ViewRanger app on your mobile device.